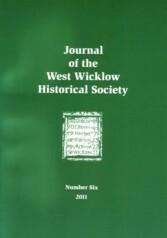 About: The sixth publication of a set of articles on aspects of West Wicklow history. This issue contains articles featuring locations as diverse as Calverstown, Co. Kildare, Glen of Imaal, High Park and Australia. The major article in this edition is ’Pastimes’ by Joseph McArdle, a fictional account of life in the Tuckmill area of Baltinglass in the late 19th century. It is a chapter from a manuscript entitled ‘The Hillside Farm, or How We Lived in the Eighties’. 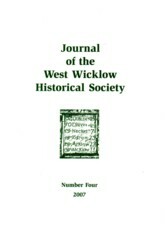 Another chapter from this manuscript was published in Journal of the West Wicklow Historical Society: Number 5, 2009. Contents: A word from the Chairman — Ramblings of the Secretary — Death in the valley / James Durney — Blackhall Castle, Calverstown, Co. Kildare / Cora Crampton – Knockpatrick Hill legend / Dorothy Leonard — Michael Dwyer and Bridget Brown of Cummock / David Ward — The role of horses in farm life in the 1920’s / Stanley Jackson — Miscellaneous biographical notices relating to Baltinglass, appearing in newspapers, 1748-1904 / Paul Gorry – Martin Byrne, 1815-1892 / Dermot Kavanagh and Brian Kavanagh — Farewell to the 25-pounder field gun / James Scannell — Hollywood, an historic village / John Glennon — Passage tombs in West Wicklow / Mairéad Connellan — Pastimes / Joseph McArdle — The Westbys and High Park House / Peadar Cullen — St. Nicholas’s Holy Well, Tournant / Chris Lawlor — Christmas Day 1910 Dublin and Blessington Steam Tramway timetable / James Scannell. 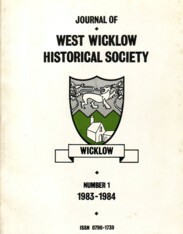 Creator / Author: West Wicklow Historical Society & contributors. About: The third publication of a set of articles on aspects of West Wicklow history. This issue covers some of the main locations within the boundaries but also widens the area of interest to include Ballymore-Eustace and Rathvilly. Contents: West Wicklow Historical Society 1989 Officers — Editorial / Joseph Rattigan — The Society’s Report / Maeve Baker — Appreciation: Paddy Byrne — William Gabriel Lyons — Tommy Bourne — Extracts from a Diary of 1869: a Wicklow Man Returns for a Bride / Richard Douglas — A Description of Dunlavin from Slater’s Directory, 1881 / John Lynott — Wicklow Biographies: No.8: Fiach Mac Hugh Ó Byrne / Cora Crampton — Wicklow Biographies No.9: James Eustace , 3rd Viscount Baltinglass / Cora Crampton[?] — The Famine in Wicklow, 1846-1847: Extracts from British Parliamentary Papers in the National Library of Ireland / Compiled by Maeve Baker — Irish-French Quaker Connections / Margaret P. O’Hare — Marriage in Ireland Before the Famine: Case Study of Rathvilly Parish / Susan E. Hood — Baltinglass of Yesteryear [poem] / Ben Dwyer — Tinahely Over the Centuries / Reverend Canon Henry Vaux Boake — The Hollywood Highwayman / Dorothy Leonard — Bacon Curing in Baltinglass in the Early Part of the Century / Maureen D’arcy — Ballymore Eustace : Odds and Ends of its History / Michael Dore — Grangecon : a Place Remembered / Lil Moore — Book Reviews / Joseph Rattigan — Index to the Coolattin Estate Emigration Records, 1847-58, Part 3 / Paul Gorry — List of Members. Extra #1: Contains black & white photographs, illustrations and maps. 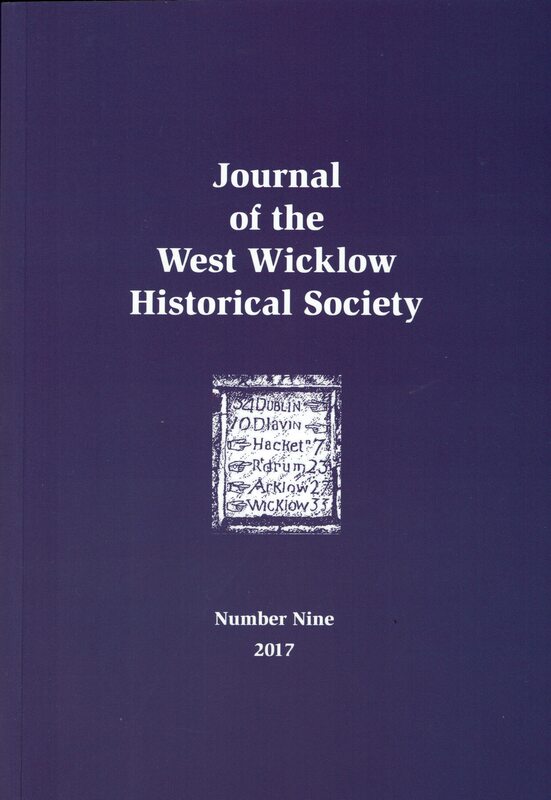 About: The second publication of a set of articles on aspects of West Wicklow history. This issue covers locations from Blessington to Tinahely with contributions from natives of the area and other historians. 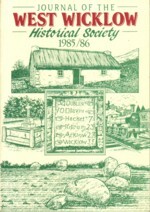 Contents: West Wicklow Historical Society 1985 Officers — Honorary Life Members of WWHS — Ireland’s First Aviator – a Baltinglass man? — Editorial / Maria Brosnan — Main st. (South side) Baltinglass 1894 (compiled from Land Valuation Office Revision Books and Slater’s Directory of Ireland 1894) / Paul Gorry — The Society’s Report / Maeve Baker — He lived in the Slaney / Jerome Keogh — Kilcommon Church of Ireland School, Tinahely / H. B. Weir — A Cemetary Cairn at Carrig, Blessington, Co. Wicklow / Theo Clarke — Michael Dwyer in Captivity / Con Costello — ‘Kilranelagh’, a poem / James J. Doyle (1869-1916) — The Valentine Family -Part 2: The Valentines of Donard / Paul Gorry & Anthony E. S. Valentine — Some West Wicklow Memorial Inscriptions / Brian Cantwell — Merginstown School, Dunlavin / Maura Kelly — Wicklow Biographies: No.5: Mór Ó Toole / Danny Boland — Wicklow Biographies No.6: Albina Ó Molloy / Cora Crampton — Wicklow Biographies: No.7: Thomas Eustace, 1st Viscount Baltinglass / Cora Crampton — Fishing for Pearl in the King’s River / Maria Brosnan — The Greenes and Kilranelagh House / Paul Gorry — The Railway Children (the Cott Family) / Liam Kenny — Aspects of the Land War at Local Level, Phase One: 1879-1882 / Joseph Rattigan — Local Agricultural Methods c.1803 / Paul Baker — The Homes of Imaal, a poem / Jerome Keogh — Graney / Dorothy Leonard — Index to the Coolattin Estate Records, 1847-56, Part 2 / Paul Gorry — Thirty Five Years in West Wicklow (“Going to the Country”) / Rhoda Byrne — Appreciations: John Ó Donovan, Jimmy Nolan of The Wood, Joseph Morrin — Book Reviews / Joseph Rattigan and Paul Gorry — List of Members. Extra #1: Contains black & white photographs and cover illustrations. 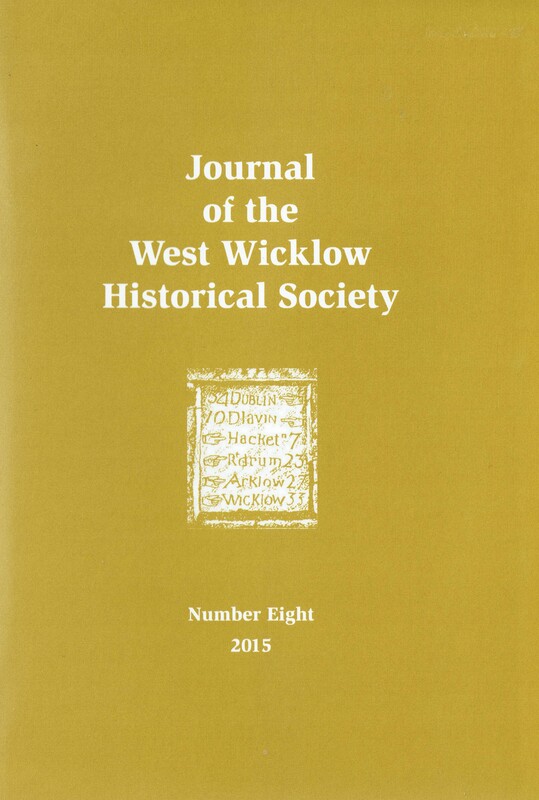 About: The very first publication of a set of articles on aspects of West Wicklow history. This issue covers locations from Lacken to Coolattin with contributions from natives of the area and from local schoolchildren. Contents: West Wicklow Historical Society Officials 1983 — Honorary Life Members of WWHS — Editorial — West Wicklow Historical News / Gerorda Quaid — The Tullow line / Cora Crampton — Tales from a drowned land / Martin J. Kelly — Notes on Golden Fort and the Saunders family / Geoffrey Marescaux de Saubruit — A Saunders elopement / Geoffrey Marescaux de Saubruit — Baltinglass Convent / Sister Therese Morrissey — Wicklow Biographies: Brandubh / Paul Gorry — Wicklow Biographies: St. Kevin / Maria Brosnan — Wicklow Biographies: St. Laurence O’Toole / Dorothy Leonard — Wicklow Biographies: Walter de Riddelesford / Dorothy Leonard — The Family of Michael Dwyer / Paul Gorry — Linen and Cotton Printing at Stratford-on-Slaney, County Wicklow (Part 1) / Paul Baker — A visit to Knockpatrick Hill / Dorothy Leonard — God’s Acre: Burial-Ground, Chapel Hill, Baltinglass / Sister Therese Morrissey — St. Mary’s Church and Rectory past and present / Verena Wilson — V. Rev. Dr. Denis Kane, P.P., V.G. (1822-1883) / Sister Therese Morrissey— Parish of Ballymore-Eustace, 1791 / William Hawks — The Valentine Family (Part 1) / Paul Gorry & Anthony E. S. Valentine — Another life / Maria Brosnan — The chapel at Kilamoate [poem] / Tom Kelly — Index to the Coolattin Estate emigration records, 1847-56 / Paul Gorry — Extracts from the Turtle manuscripts — Query — Junior Section: Baltinglass G.A.A. club during the years / Laura Wall — Junior Section: Local History / Bernadette Keogh — Junior Section: The Georgian / Marina Doyle — Junior Section: Baltinglass Hill Cairn / Kieran McMahon — Junior Section: Rev. Marchbanks / Ashley Bourne — Junior Section: Blessington in the 15th century / Kay Tutty — Junior Section: The Rectory- Baltinglass / Andrea Wilson. Extra #1: Contains some black & white photographs.